We have Kimono English events once a month. 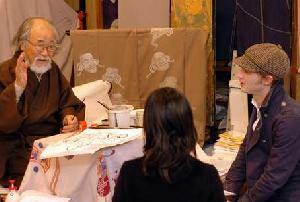 These photos ware from Kimono handcraft painter event at 1 of April. After entering your e-mail which you got our mailing and pressing "unsubscribe", you will get an e-mailwith URL in Japanese. Please visite the URL. Then you will be removed from our mailing list. Cerebrate Hina-matsuri (Doll festival for girls) on the 3rd of March whilst wearing Kimono! "Yukata fitting lesson and after-party. 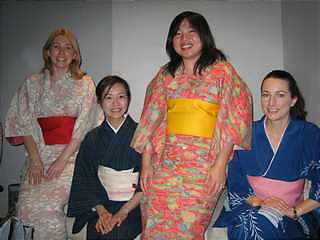 My wish is that you can learn how to wear a kimono or yukata by yourself, in your own country. Help me spread the Kimono culture all over the world." If you are intareseted in it, please have a look at the following site. Japan and the Kimono.“Kimono” the Japanese national costume, originated from China. About 14000 years ago, during the Asuka era (around 600 to 700), the Kimono was introduced with Buddhism. At that time, Kimonos were worn by some aristocrats as a political strategy. By wearing the Kimono they were showing their faith in Buddhism. Interested in the arts of Kimono and Yukata?Let's have a potluck lunch party and a discussion on what is real and authentic concerning Kimono and Yukata , and the history of them as well as information on wearing and folding of them! Men and children are welcome! Where: at Omiya, 35 minutes direct from Ebisu see when you sent us resavetion e-mail, we will sent the map. Option2:JPY 500 + a dish to share and bring your Yukata or Kimono and Obi to study the proper way to ware it. 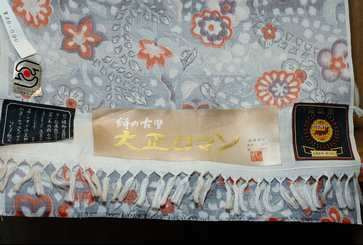 Want you try to make an original Yukata bag by your self? 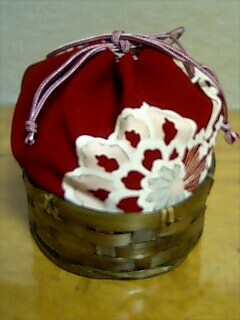 We will have a lesson “Make a Yukata bag, after the event from 15:00-16:00 at the same location. We have also started a Yukata privet lesson. The fee is 1000yen per parson for 1and half hour. If you find the place and give me the transplantation fee, I’m happy to go there to teach you. We will have a special memorial event at 27 of May at our shop. 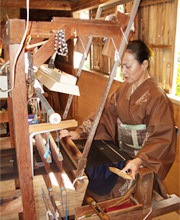 You can try to weave Kimono, silk textiles! Honjo Gasuri weavers are coming. Honjo Gasuri is a local kimono. Now hardly you can see it. Honjo silk originated from thicky woven clothe, which has its roots in the silk rasing industry in the north of Saitama prefecure. By various technique, a wide range of fabrics, from the sipmple"Kasuri (Garuri)" desing to highly elaborate once as Tekukuri-kasuri, Itajime-Kasuri, Nassenkako-Kasuri etc, are produced. event put on by the Sakaeya Kimono Shop in Omiya. everything into English on the day. Reservation is essential as space is limited so please email. Don’t miss out on this unique experience. interested in hearing more about this service please visit the website or email.